PRODUCT DESCRIPTION: Small device which sits on top of replaceable aerosol can. The device is only about the size of a baseball. However, there is a lot built in enabling this small animal repeller to handle a multitude of applications. Runs on 4 AAA batteries. Motion detector is built in; has 5 positions. Motion detector has a maximum range of 3 feet. 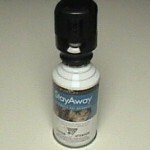 PRODUCT IS DESIGNED FOR SMALL AREAS: Spray nozzle has three positions; angled down, straight out and angled up. Emits sound 1 second before releasing air blast. Device clamps onto replaceable air cans. UNIT COMES WITH 1 AIR CAN WHEN PURCHASED. 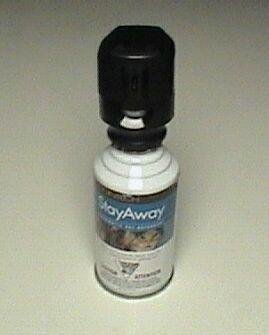 THIS IS THE ONLY PRODUCT WE HAVE FOUND TO EFFECTIVELY STOP CATS FROM HABITUAL "SPRAYING"
WHERE TO USE IT: Inside or outside. More common applications include window sills, plant pots, plant beds, furniture, drapes and basically any single "spot" location where you're wanting to change a specific behavior in an exact location. RATE OF APPLICATION: By design these units have a small range. This is so that the air refill does not deplete itself by going off needlessly. The range of the motion detector is about 3 feet with a 70 degree angle. This means you may have to install more then one unit if the area you are attempting to protect is approachable from all sides.